Tags: dog nose medicines, dog paw and pad medicine, dog hot spots, dog Nasal depigmentation, dog vitiligo, dog Snow noseisa, dog allergy, dog Plastic Dish Nasal Dermatitis, dog discoid lupus erythematosus, pemphigus foliaceus, and zinc responsive dermatosis, dog Stenotic flares, dog Nosebleed, dog epistaxis Dermoscent Bio Balm Skin Repairing Care for Dogs - 50 ml. 100% natural products, organic certified ! ! Bio Balm maintains the necessary suppleness and moisture necessary to avoid and treat hyperkeratosis of the nose, paw cracks, and lesions - prevents infections - does not contain mineral oil or petroleum-based ingredients - great for cracked noses, paw pads, calloused pressure points or Hot Spots. Apply 2 or 3 times a day to the paws. I want to let you know about a great classified ad I have just found. This classified may be found at https://gsdsite.com/ads-2672/dermoscent-bio-balm-skin-repairing-care-for-dogs--50-ml.html. 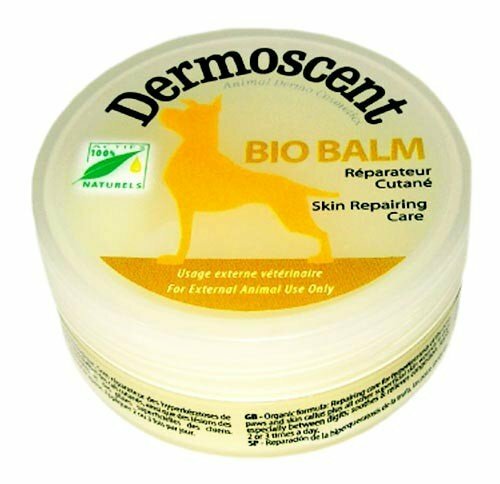 Title of the classified: Dermoscent Bio Balm Skin Repairing Care for Dogs - 50 ml.